Love, Simon is both a coming-of-age story – the kind usually about lovesick teenagers – and a coming-out tale of apprehension. High school senior Simon Spier (Nick Robinson, Jurassic World), by his own admission, has a great family, good friends, and a happy life. He’s like most other kids his age with one exception – he’s gay. No one knows it and he struggles with how and when to reveal this. One day, a post on the school’s online gossip forum from a student calling himself “Blue” confesses that he’s gay but hasn’t told anyone. Simon writes to him in secret under the pseudonym “Jacques.” Class clown Martin (Logan Miller) happens upon this correspondence. He agrees not to “out” Simon only if he will encourage his friend, new transfer student Abby (Alexandra Shipp), to go out with him. Directed by Greg Berlanti, Love, Simon is reminiscent of John Hughes films of the 80s. It presents an interesting and diverse group of characters. Simon’s friend Leah (Katherine Langford) has had a crush on him since they were kids, and his pal Nick (Jorge Lendeborg, Jr.) is a straight athlete. The adults include oddball assistant principal Mr. Worth (Tony Hale, Veep), a frustrated drama teacher directing a school production of Cabaret (Natasha Rothwell), and Simon’s parents, Emily (Jennifer Garner) and Jack (Josh Duhamel). The film makes a point of showing that Simon is very much like other kids. He’s popular and involved in school activities, enjoys a good relationship with his parents and younger sister, and looks forward to graduation. He’s not tormented, depressed, or suicidal. But he fears life will change dramatically once everyone knows he’s gay. Mr. Robinson is an appealing actor who plays Simon seriously, though the film has its share of humor. 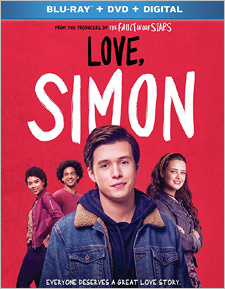 The script paints Simon as nearly flawless, which is unrealistic but seems an attempt to make Simon the poster boy for gay teens just as Sidney Poitier played the ideal African-American in so many Hollywood features. Making Simon a bit rougher around the edges might have made him more relatable. Love, Simon is by no means a downer, and that is its charm. By not being melodramatic or operatic in dealing with Simon’s big secret, it blends smoothly into the teen comedy genre. Director Berlanti paints perhaps too rosy a picture of how peers in high school react to openly gay kids. It would be ideal if kids were as thoughtful and nonjudgmental as the ones portrayed. Love, Simon is regarded as the first gay teen romance from a major studio, even though Simon doesn’t learn the identity of “Blue” until the end of the picture. As Simon wonders who it might be, he thinks about who among the characters we’ve met might be the one. This mystery element builds suspense and keeps us guessing, with red herrings along the way that would delight Agatha Christie. The film is rated PG-13, making it accessible to its potential audience. Movie mogul Sam Goldwyn once said, “If you want to send a message, call Western Union.” True enough. Audiences don’t want preaching or having a point of view hammered. Love, Simon keeps the entertainment factor foremost. Bonus materials on the 2-disc Blu-ray/DVD Combo Pack include deleted scenes; audio commentary by director Greg Berlanti, producer Isaac Klausner and co-screenwriter Isaac Aptaker; and the featurettes The Adaptation (turning the book Simon vs. The Homo Sapiens into a movie), The Squad (how the cast was chosen), #FirstLoveStoryContest (a fan relates his first time falling in love), Dear Georgia (about filming locations in Atlanta), and Dear Atlanta (discussion of why the city was chosen by the filmmakers).